In anticipation of the 2016 presidential election, LWVMA has begun identifying and selecting books that may help inform kids and teens about our nation’s history and system of voting and elections. Several such books appear below. Local Leagues may wish to: (a) donate copies of the books to libraries; (b) award them as student essay or video contest prizes; (c) present them as League prizes at school awards ceremonies; (d) include them in gift baskets for silent auctions or other fundraisers; or (e) organize programming featuring them. These books also may make fine gifts for children and young adults. 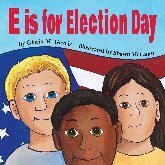 E is for Election Day, by Gloria Gavris, author, and Shawn McCann, illustrator (Checkers Book Press, 2015), grades 2 to 5. Hot off the presses, this high-spirited A-to-Z book features delightfully illustrated descriptions of important aspects of the election season, from campaigns to recounts. Massachusetts author Ms. Gavris devotes each page to an important element of voting, ranging from “American Elections” (the text begins with “Lucky you!”), “Ballots” (“Shhhh!”), and “Conventions” (“What a party!”), to “Zig Zag” (“Candidates. . .will be zigzagging through neighborhoods!”). Kudos to Ms. Gavris for encouraging young readers to think about their future responsibilities and roles as voters – and about the ways they can participate even before they turn 18. We find this a fresh new approach to sparking young readers’ interest in civic engagement. 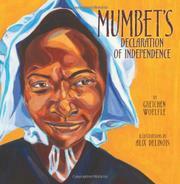 Mumbet’s Declaration of Independence, by Gretchen Woelfle, author, & Alix Delinois, illustrator (Carolrhoda, 2014), K through grade 3. Ms. Woelfle masterfully tells the true and moving story of Mumbet Freeman, an African-American enslaved woman in 18th-century Massachusetts. After hearing the proclamations in the Commonwealth’s new constitution relating to freedom, equality and voting, Mumbet begins her quest for a declaration of her own freedom. The simple, elegant language of Ms. Woelfle and warm, richly hued illustrations of the Haitian-American artist Alix Delinois evoke Mumbet’s determination and intelligence. Whether read aloud or to oneself, this book enthralls readers of all ages. Hurray for Ms. Woelfle and Mr. Delinois for bringing to life the riveting story of this trailblazer and her place in the history of our state and nation. Vote! 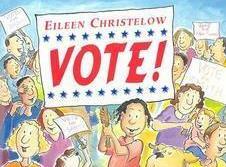 by Eileen Christelow, author and illustrator (Clarion Books/Houghton Mifflin, 2004), grades 2 to 4. Includes at end a glossary; timeline on voting rights; FAQ about political parties, and a list of websites of relevant organizations, including the League of Women Voters. With an imaginative story and whimsical illustrations, Vermont author and illustrator Eileen Christelow draws the reader into the world of an African-American mayoral candidate, her supportive family and diverse friends. As two playful dogs provide amusing running commentary, the author handles with finesse important issues surrounding debates, fundraising, advertisements, voting and recounts. We can see why Scholastic has so highly praised her work. Bravo to Ms. Christelow for creating this charming, funny and edifying page-turner on campaigns and elections! 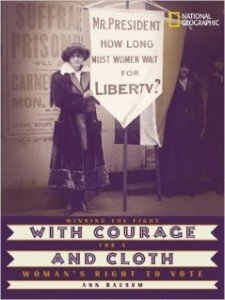 With Courage and Cloth: Winning the Fight for a Women’s Right to Vote, by Ann Bausum (National Geographic Society, 2004), grades 6 to 12. Includes at end profiles of suffragettes; chronology from 1788 to 1920; lists of books, videos, places to visit, and websites, including the League’s; sources, and bibliography. This National Geographic Society history of women suffrage in the United States will captivate curious tweens, teens and adults alike. With intelligence and insight, author Ms. Bausum highlights the commitment and contributions of some of the suffrage movements’ most compelling activists, beginning with the great African-American Sojourner Truth and including Lucretia Mott, Alice Paul, Elizabeth Cady Stanton, Susan B. Anthony, Lucy Stone, Inez Mulholland, and, naturally, League of Women Voters founder Carrie Chapman Catt. A treasure trove of rare sepia photographs shows these courageous women marching arm-in-arm, picketing, blockading, demonstrating, and publishing advocacy literature. We tip our suffragette hats to Ms. Bausum and the National Geographic Society for bringing the story of the 19th Amendment to life in this handsome book. Note: Views and opinions expressed in the books referenced above are those of the authors. The LWVMA endorses neither books nor authors. The LWVMA has received no commercial benefit in connection with this notice.